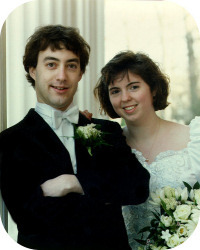 Lisa was foolish enough to marry me. We had Peeps for hors d’oeuvres. Look how happy you are! I’m told the Peeps looked quite handsome on the silver platters. Unfortunately, they were all slaughtered before we were done with the photos. Congratulations! 13 is a great number, but 14 will be even better. Congratulations! That’s a totally cute pic–completely belying your peep-killing nature. You have this cocky “oh, I can handle this marriage stuff like it’s nothin'” look on your face. Lisa has this “yeah, people, I’ll be starting that retraining program tomorrow” look on hers. 😛 Congrats! Thirteen years later, the retraining program is still trying to get off the ground… or so I am led to believe. Look at youse guys! Too cute! Lovely photo–but where are the peeps?